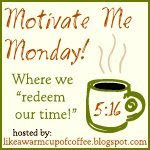 It's Motivate Me Monday over at Like a Warm Cup of Coffee - be sure to stop by for plenty of motivation to start your week off right! There are so many lovely blogs out in the blogosphere, but the ones that motivate me the most are the blogs of other Christian women. I'm not saying that there aren't great blogs out there by non-Christian women, but I am most motivated by other women who are like me or women that I strive to be like. I was delighted to see that Internet Cafe Devotions came up with a list of the Top 100 Christian Women's Blogs for 2008! This list was determined only by reader nominations. 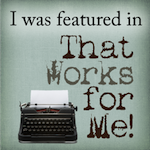 There are so many wonderful blogs on there - some I know and some are new to me. I plan to visit them all very soon - looking for more motivation! 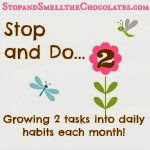 Click on the button to go see the list and all the wonderful blogs! I am stopping by from Like a warm cup of coffee.....I gotta say that I LOVE your blog. Check mine out, we have alot in common....especially our love of chocolate!!! I was so excited to see your name on the list too my friend! You deserve it! I love you & your blog! 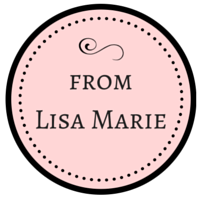 Isn't it great that we have each other in this crazy online community thing called blogging?! It really encourages and motivates me as I journey with all of you. "I found it." she said a bit embarrassed. LOL. That's what I get for clicking on the post link instead of the blog link. Okay I'm going to make up for it as your TOP COMMENTATOR. Let's see. I think I'll say something like, I voted for you in this category because you are so much like me and if we were both going to be in one category together this would have been the one. (more sucking up to come.) I'll just wait till your next post. HURRY UP! LOL. Do I get brownie points for longest post!!!! Congratulations! Love all your blogs! Hope to enjoy some tastey chocolate in real life with you gals! 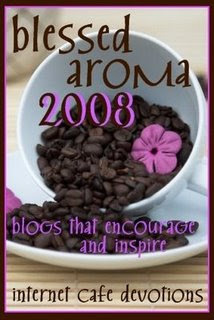 Just stopping by to say congratulations for being one of the Internet Cafe's Top 100 Christian Women's Blogs of 2008!